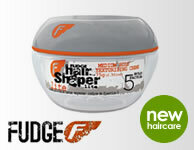 ICE Hair Care for Men by Joico. I-C-E is a full line of hair care products, including shampoo's, conditioners, waxes, sprays and gums, designed to help create todays latest trends and outrageous hairstyles. This fashion forward and extremely versatile salon range allows you to break through the ordinary and give your hair a new dimension of expression. With these excellent and functional haircare styling tools you can instantly determine the form, function and structure of your hair with this clean and modern, streetwise yet savvy haircare range.